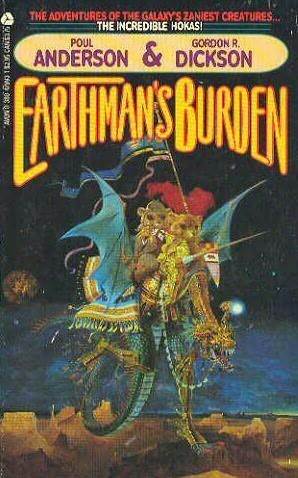 Humorous science fiction is all too rare. 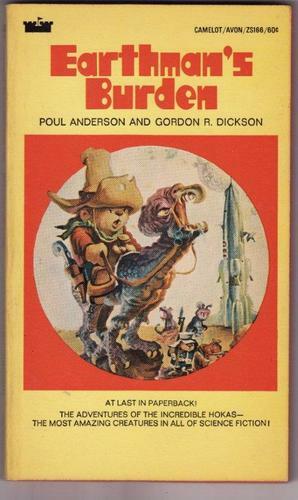 One of the most successful humorous series is/are the Hoka stories of Poul Anderson & Gordon R. Dickson. 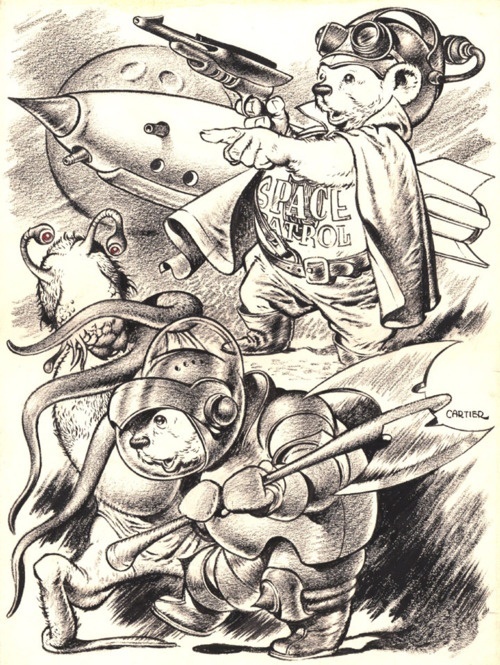 They began in the short-lived Other Worlds Science Stories in May 1951, moved to Universe Science Fiction after Other Worlds ceased publication, then to The Magazine of Fantasy and Science Fiction when Universe bit the dust. By 1957 there were almost enough Hoka stories to fill a book. 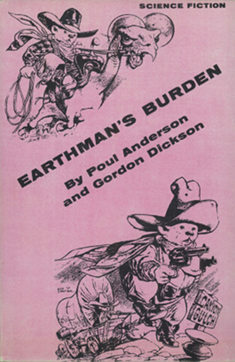 Anderson & Dickson added one original story and a short “Interlude” after each to tie them together into a novel, and Earthman’s Burden was the result. The 1950s were the postwar era with the Marshall Plan and the sparklingly new United Nations, when idealistic America was trying to pull the whole world up to Western levels of prosperity and democracy. The Hoka stories carried these ideals into space. NYC, Gnome Press, July 1957, 185 pages, $3.00 [1970 reprint; 1979 reprint]. Illustrated by Edd Cartier. By the 25th (?) century, the galaxy is being explored and politically united in the Interbeing League, benevolently led by Earth (which is led by America). Unfortunately, a few totalitarian planets are out to sabotage the League so they can engage in old-fashioned empire building. One of the newest planets discovered is Toka, inhabited by two rival intelligent species, the reptilian Slissii and the mammalian Hokas. The Slissii, roughly humanoid tyrannosaurs, are cruel and cunning, while the friendly Hokas look like three-feet-tall, tubby, golden-furred teddy bears; so there is no doubt which the Interbeing League hopes will win to form the planetary government and join the IL. Unfortunately, the Hokas are disunited and – childlike. They have a hard time taking anything seriously. Worse, they cannot distinguish between fact and fiction, and the IL’s serious manuals on good government are ignored in favor of the more exciting Earth fiction: Westerns, pirate sagas, jungle ape-man thrillers, and so on. Each Hoka nation has picked its own genre of colorful fiction to model itself after. Young Ensign Alex Jones of the Terrestrial Interstellar Survey Service finds himself the IL’s new envoy to Toka, to be officially neutral but unofficially to make sure that the chaotic Hokas win out over the better-organized Slissii, and remain unconquered by hostile alien invaders. “The Sheriff of Canyon Gulch” brings Alex Jones to Toka as a marooned Survey Scout, to a small Hokan town that has taken the pulp-fictional cowboys & Indians uncritically as its role-model. The green-skinned Slisii are, of course, the Injuns. The Hokas hope at first that Alex is a Lone Stranger-type hero, but after he naïvely fouls up trying to live up to the stereotype, they demote him to the post of Sheriff – everyone knows that the Sheriff is the biggest blunderer of the community. Alex, figuring that he can’t sink any lower, gets thoroughly drunk on the Hoka’s rotgut and accidentally leads them to victory over the Slissii. “Don Jones” moves to an IL hostel on Earth, where a “Tokan ursinoid” delegation has been brought to consider the advantages of IL membership. Alex Jones is appointed their Official Host because he has more hands-on experience than anyone else with the Hokas. Alex and his girlfriend Tammi Hostrup try to follow the IL’s officious guidelines, despite the pettiness of Alex’s superior, Hardman Terwilliger; the jealousy between Tammi and Terwilliger’s secretary Doralene Rawlings; and the six Hokas who, after an evening at the opera, have decided that they have become Don Giovanni & Company: the unstoppable lecher & invincible swordman; the crafty servant; the arrogant soldiers; etc. – especially The Ghost of the murdered Commandant (the Hokas are looking for someone to pour whitewash over to draft as the ghost). Alex manages to maneuver the resulting farce into a bureaucratic victory, and he is appointed the permanent resident Plenipotentiary to Toka. The remaining four stories – “In Hoka Signo Vinces”, “The Adventure of the Misplaced Hound”, “Yo Ho Hoka!”, and “The Tiddlywink Warriors” – take place over a dozen years back on Toka. Alex, now married to Tammi and living in the new planetary capital of Mixumanu, is forced every few years by some crisis or other to travel to a different Hokan community to resolve the matter. He becomes drafted in each to play an important but powerless sidekick role. 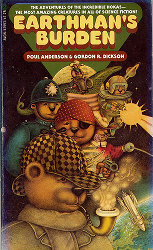 In the Space Patrol, he is the senior Coordinator; in Sherlock Holmes’ London, he is Watson; in the Royal Navy of Napoleonic times, he is the pirate Captain Greenbeard (Poul Anderson attended the World S-F Con Masquerades for the next dozen years as Captain Greenbeard); and in the Foreign Legion he is the raw recruit who is expected to die nobly for la belle France. The Secret Service chief came into the office on the run, tangled with his sword, and skidded across the floor. Somehow he got his head jammed into the wastebasket. Alex dragooned Brassard into pulling on the legs while he held the container. The Hoka emerged with a pop and looked wildly around him. You would think that futuristic interstellar teddy bears would be a natural subject for Saturday-morning animated TV, and Poul Anderson claimed after the 1970s that he had put his daughter through college with the option money that he got for the rights to produce a Hoka TV cartoon series. Frustratingly, nothing ever emerged. It would be fascinating to see the cartoon presentation packages for the TV networks which that animation studio must have produced. 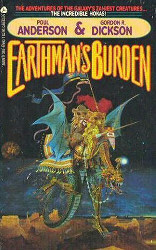 But if you do want Earthman’s Burden, you may have to settle for one of the three paperback reprints (Avon, 1970, 1979, and 1985). The 1957 hardcover first edition hardly exists any more. Gnome Press was an underfunded enterprise whose fan publisher, Martin Greenberg (not the later Martin Harry Greenberg, the s-f anthologist), refused to let a lack of money stop him from his dream of being a s-f speciality publisher. He notoriously did not pay his authors the money that they were promised. 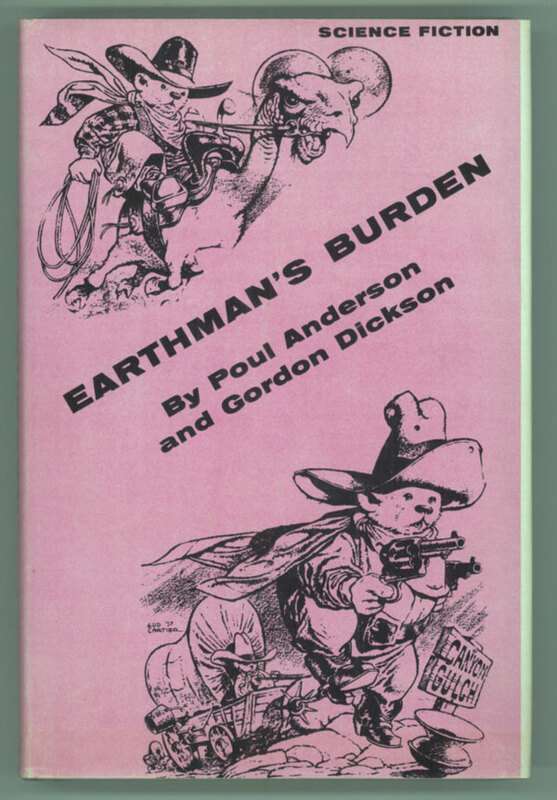 Earthman’s Burden was published as cheaply as possible, with a dust jacket that merely reprinted some of the interior art, in falling-apart binding, on a high-acid paper that was turning brown and brittle as it was coming off the presses in 1957. Today even s-f collectors who have tried to keep the book in mint condition have only something that they can barely touch without its disintegrating into wood pulp dust. Up, up and away... in my beautiful balloon!